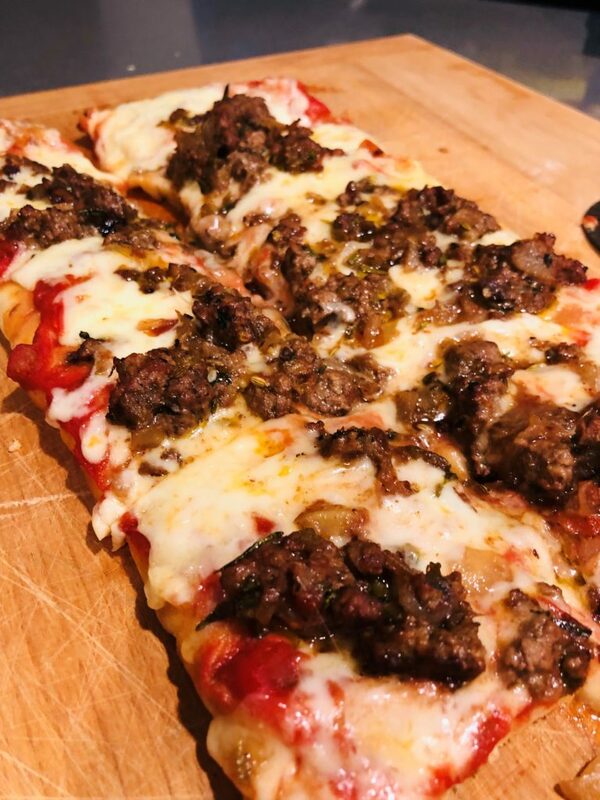 Sometimes I feel like making my own pizza dough, sometimes I like buying the pre-made flatbread slabs and covering them with my own toppings. 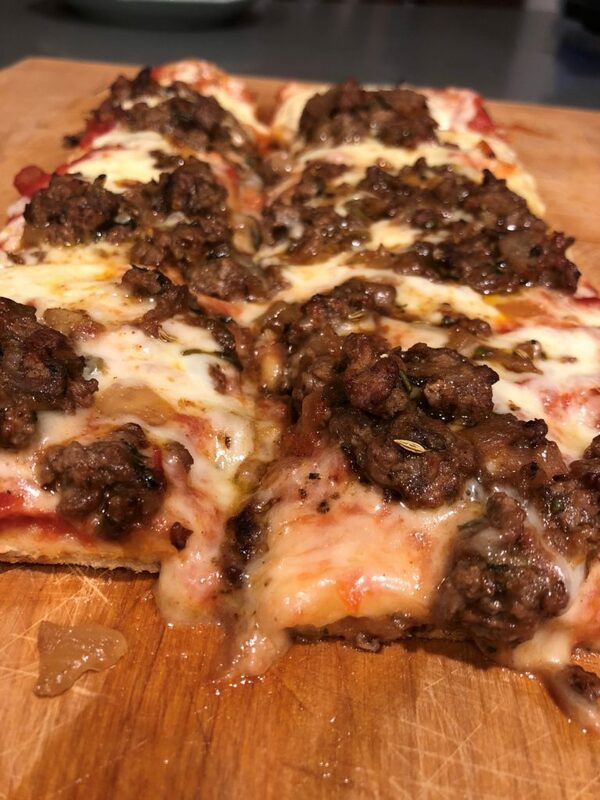 I’ve made this pizza twice now, both times with the Trader Joe’s flat breads. 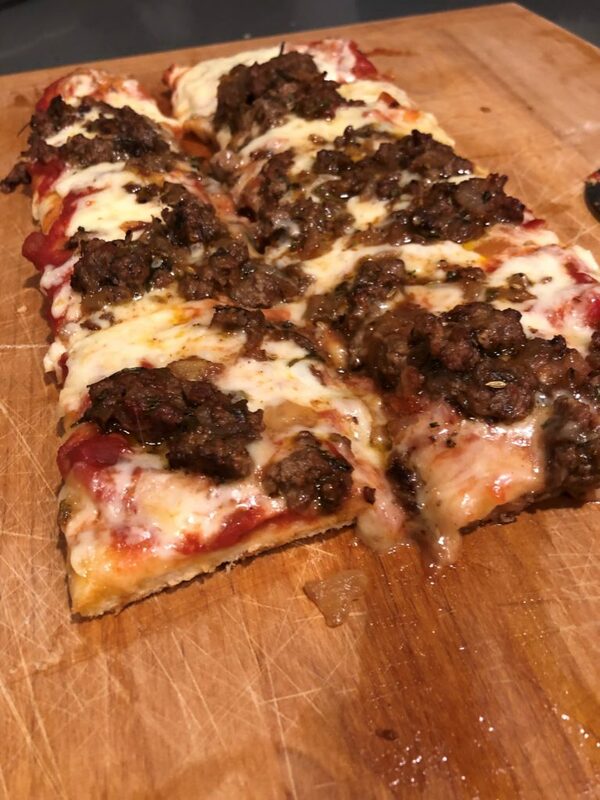 The base is your choice, this recipe just tells you how to bring it all together. 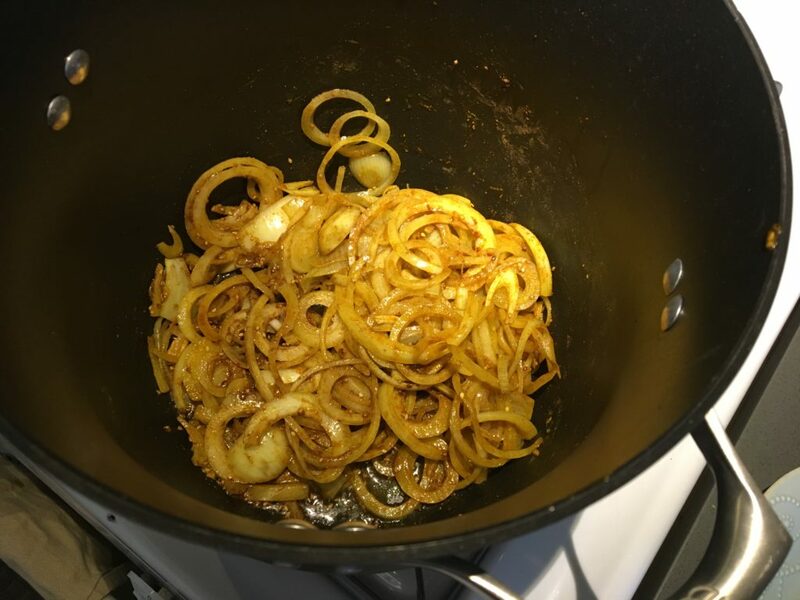 Heat some olive oil in a pan over medium-high heat and cook the onion and celery until tender, about 5-7 minutes. Add the lamb to the pan, and continue to cook until the meat is cooked through, adding the fresh herbs and dry spices about halfway through. Open the can of crushed tomatoes. Stir in the garlic, sugar and crushed red pepper. Allow the flavors to meld. 3. Shred the cheese (you can do this while the lamb mixture is cooking). Preheat your oven per the instructions on your crusts. Spread a thin layer of the sauce over the crusts (you will have much more than you need). Sprinkle a generous layer of cheese. 5. Bake per the instructions on your crusts, or until the cheese is bubbly and golden. Recently, I attended Caleb’s bris. (He’s this perfect little guy that just joined us in this world.) It was lovely and emotional and he slept through the whole ceremony. And, like any good Jewish celebration, it was accompanied with copious amounts of food and dessert. 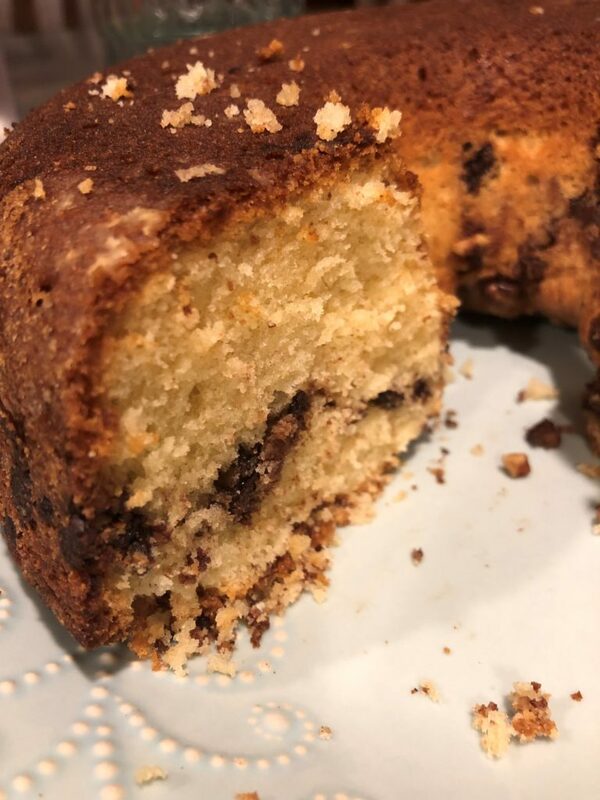 One particularly delicious one – this coffee cake. 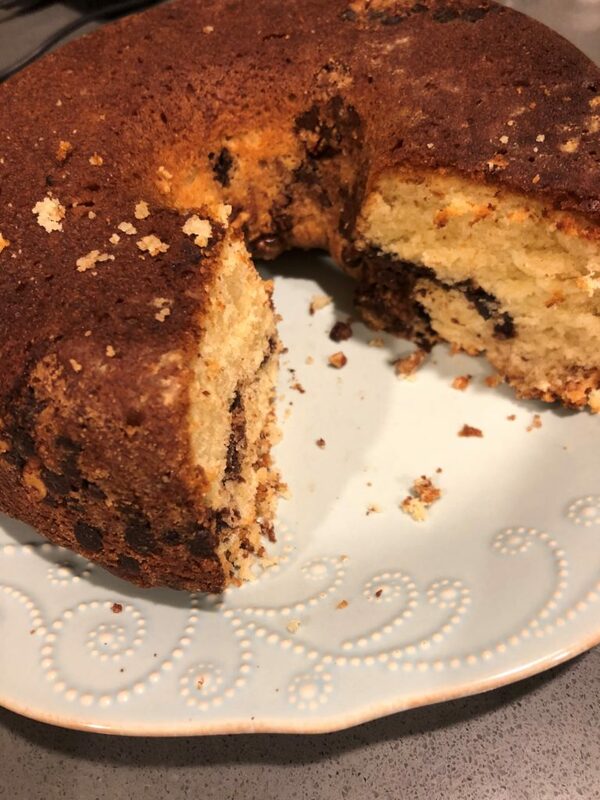 It was so good, the baker gave me the recipe and I made it for Grandma the same week. 1. Generously butter a bundt pan. 2. In an electric mixer, combine the butter, 1 1/4 cup sugar, and eggs, and beat until light and fluffy. 3. Add flour (sifted if you can) and baking powder and baking soda to the bowl. Beat to combine. 4. Add vanilla. Blend in. 5. Make the filling: combine the two remaining tablespoons sugar with the walnuts, cinnamon and chocolate chips. 6. Spoon about half the thick mixture into the bundt pan. Then sprinkle about half the filling. 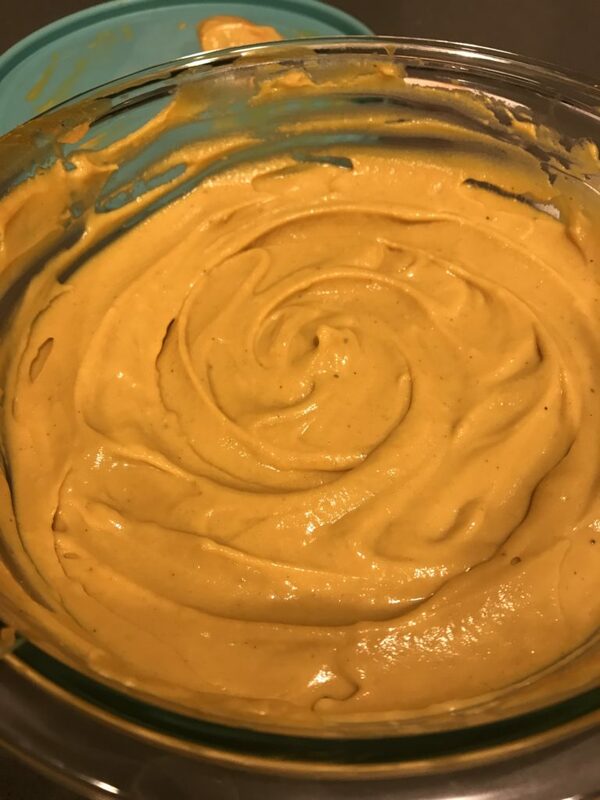 Spread the remaining cake mixture over the top, and then the remaining filling mixture. 7. Place into a cold oven, set at 350 degrees, for about 55 minutes. P.S. My sister, Ashley, made it today. Hers looks pretty amazing too, and she said it tasted great! Warm and comforting, flavorful and beautifully spiced, this stew was a real winner. 1) Saute the onion and celery with the olive oil over medium-high heat for about 8 minutes. 2) Stir in the ginger and garlic and cook for one minute until fragrant. 3) Stir in the spices and cook for one minute. 4) Add the carrots, the garbanzo beans, the lentils and the broth. Bring to a boil, then turn down and simmer 25-30 minutes (ensuring lentils soften). 5) Add kale, tomatoes, and half the parsley. Cook for 10 more minutes. 6) Turn off the heat. Stir in the remaining parsley, the cilantro, and the lemon juice. Add salt to taste. Optional: Serve over rice, topped with a dollop of goat cheese or a sprinkle of feta. 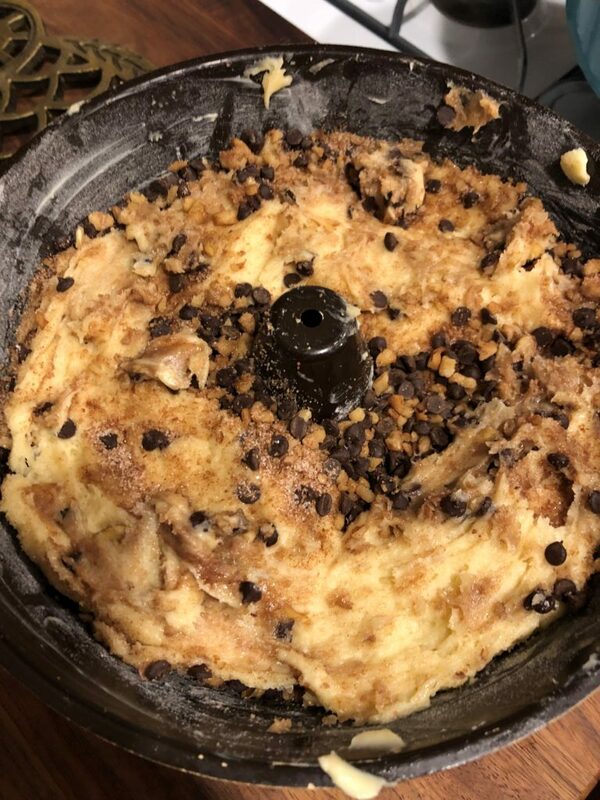 While perusing Instagram, I came across a post about a blog featuring family recipes and the meaning behind them. The recipe of the week, featured on Food52, was for a dish called green spaghetti with its origins in Peruvian cooking. Yes, I know, the ingredients seem like an odd combination, but trust me, they work. This is so delicious. 1) Boil water and cook the pasta until done. Drain and set aside. Saute the red onions in the olive oil over medium and/or high heat until they start to brown, about 7 minutes. Add the garlic and cook for about 3-5 more minutes. Remove about one quarter of the onion/garlic mixture and set aside (for the aji topping suace). Add the spinach to the remaining onion/garlic mixture and cook for a few more minutes. Stir in the boullion cube if using. 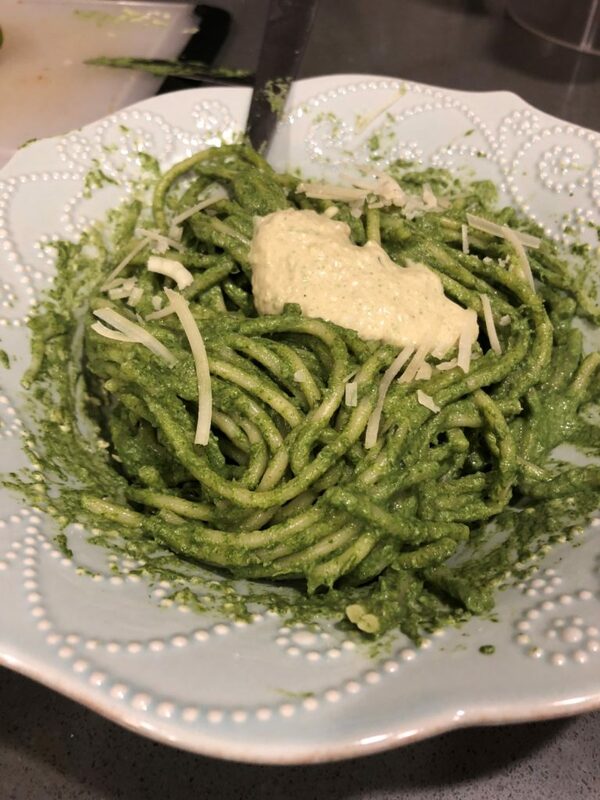 3) To finish the green sauce: In a blender, combine the onion/garlic/spinach mixture, the 1 cup of evaporated milk, and half of the cream cheese. Blend well until smooth (about 3 minutes). Pour over the spaghetti and mix well to coat the pasta. 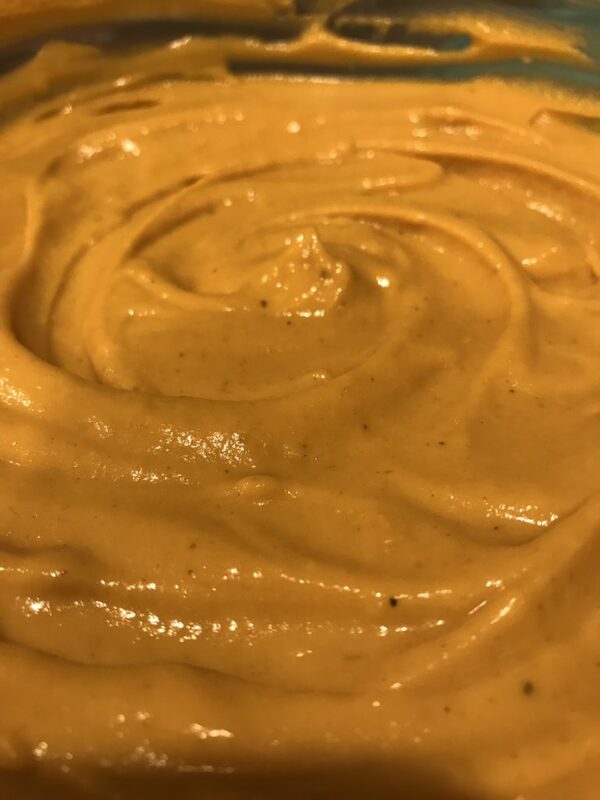 4) To finish the aji topping sauce: In the blender, combine the set aside onion/garlic mixture, the 1/4 cup evaporated milk, the other half of the cream cheese, the peanut butter, and the jalapeno. Blend well until smooth. 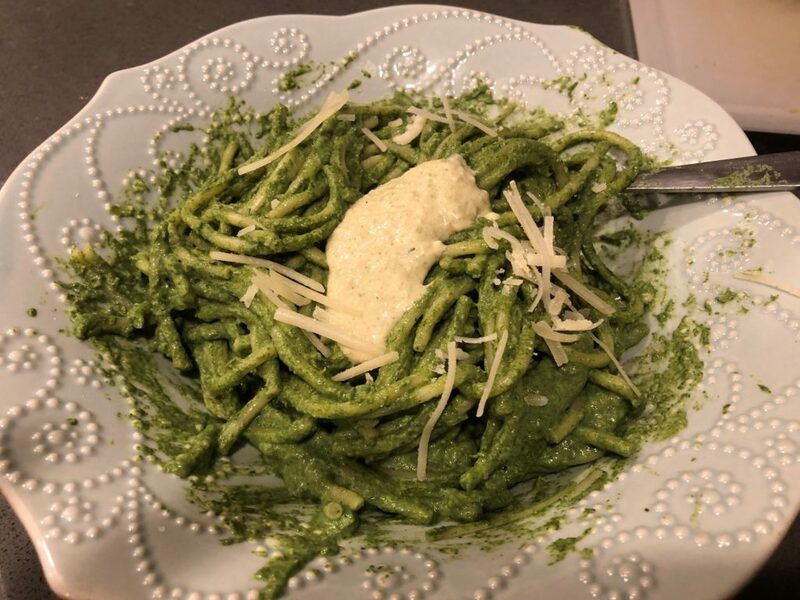 5) To serve, you can either mix the aji topping sauce into the green pasta, or add in dollops along with a squeeze of lime and some Parmesan cheese. We were lucky enough to spend the Fourth of July in Lake Chelan at the Foster lake house. It was a week of fun in the sun, in the water, and with extended family. 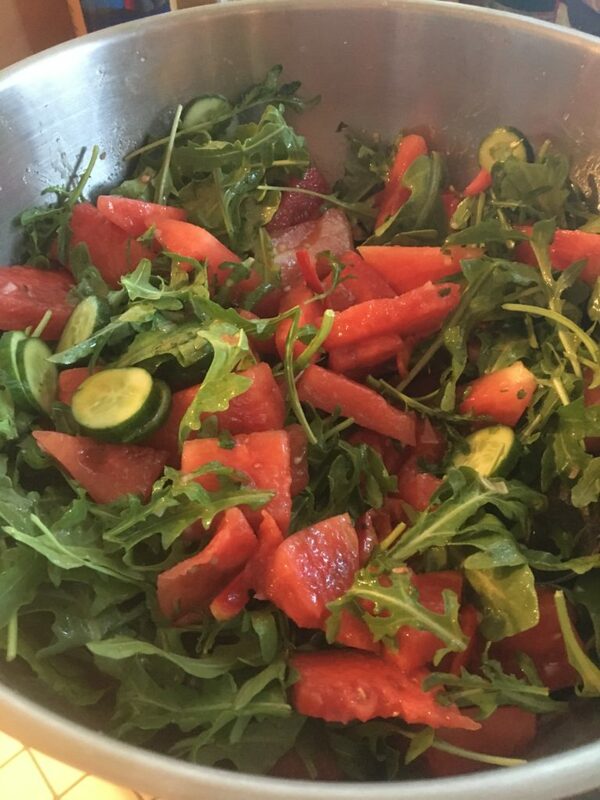 We attended the neighbor’s Fourth of July potluck, and there tasted what is hands down my favorite watermelon salad. Kathy procured the recipe, from Sunset Magazine, and Simon and I had the opportunity to make it together. Hope you like it too! 1. Cut up the watermelon and cucumbers. Put in a bowl. 2. Make the vinaigrette: In a jar, add the olive oil, lime juice, vinegar, cilantro, mint, shallot and chile. Shake well to combine. 3. 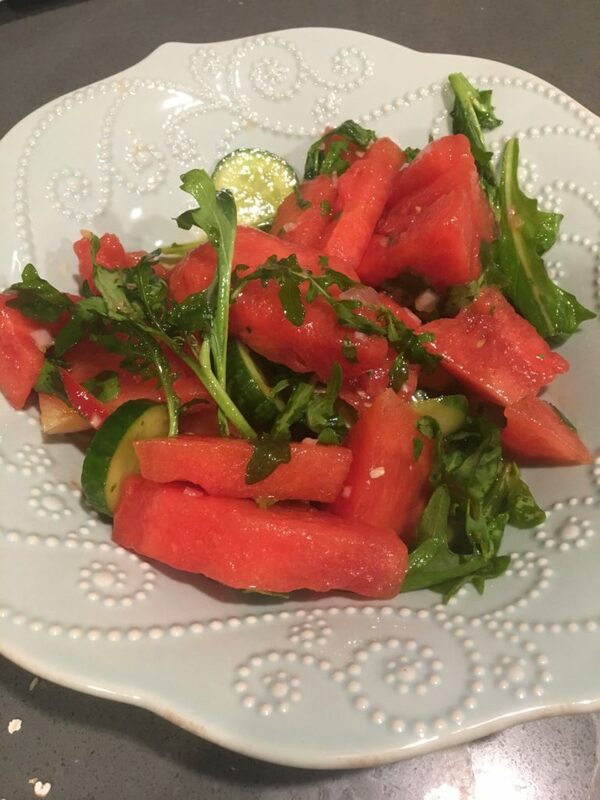 Pour the dressing over the watermelon and cucumber. Then stir in the arugula. Add salt to taste. After spending the day with Gigi and Great Grandpa, we came home with a bag full of mini limes. We turned to the internet for some recipe ideas and found one without butter, and that incorporated yogurt, on the Smitten Kitchen website. Last night we were able to whip this up before Simon was out of his high chair, and the result was absolutely delicious. 1. Preheat your oven to 350 degrees. 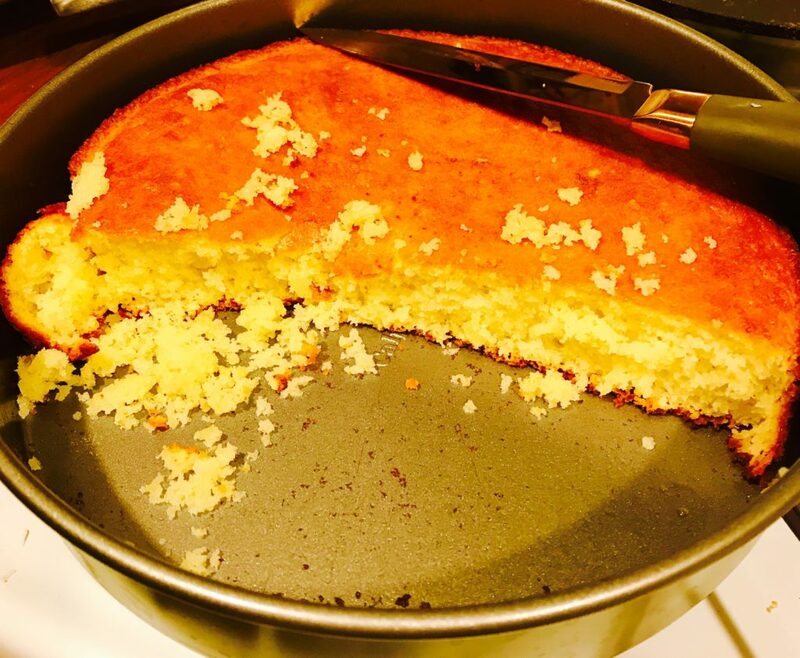 Grease a 9″ round cake pan. 3. Whisk the eggs in one by one. 4. Add the flour, baking powder and baking soda to the bowl and whisk until just combined. 5. 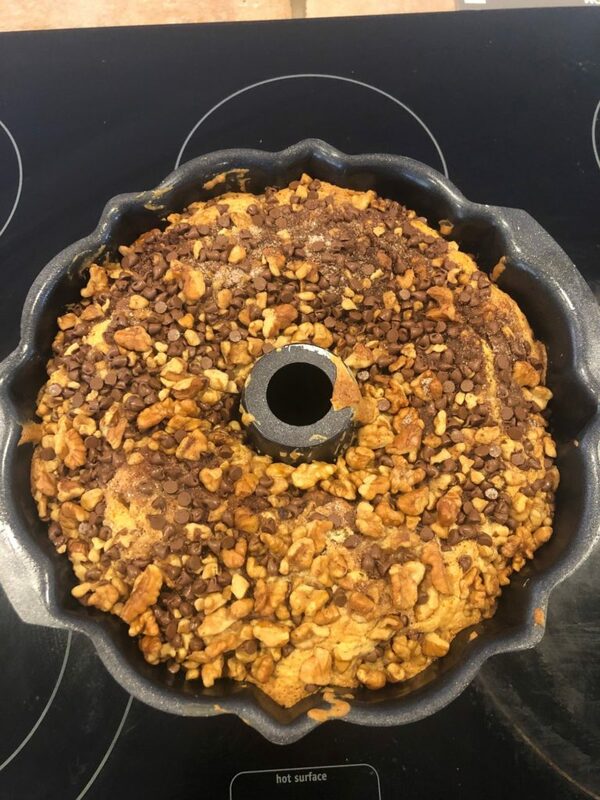 Pour into the prepared cake pan and bake for about 35-40 minutes until it is golden brown and a cake tester in the center comes out clean. 3. While the pasta is cooking, heat up the olive oil and saute the diced onion for a few minutes. Then add the diced zucchini and saute for another 5 minutes or so. 4. When the pasta is done, drain it and stir it with a handful of the mozzarella, a smaller handful of the Parmesan, and a big scoop of cottage cheese. Then stir in the zucchini mixture. 5. Spray a lasagna baking dish, or a large heavy-bottomed pot (like a Le Creuset). Spread the pasta mixture in the bottom of the pan. 6. Add the garlic paste to the saute pan over medium-high heat. (If there is no oil left over, add a little more olive oil.) Let it cook about a minute, and then dump in one pound of the spinach. Add about 1/2 cup of water, and let the spinach wilt (stirring occasionally), about three minutes. Once wilted, remove from the pot, roughly chop, drain some of the liquid in a colander, and then put in a big bowl. Repeat with the other pound of spinach (but no need to add garlic a second time). 7. When all the spinach is done, add in the ricotta, the remaining cottage cheese, herbs, salt and pepper to the bowl. Mix well. 8. Spread the spinach mixture over the pasta mixture. Then sprinkle the remaining shredded cheese over the spinach mixture. 9. Bake covered for about 25 minutes. Then remove the cover, turn up the heat to 400 degrees, and cook for another 10 minutes until the top is brown and bubbly. 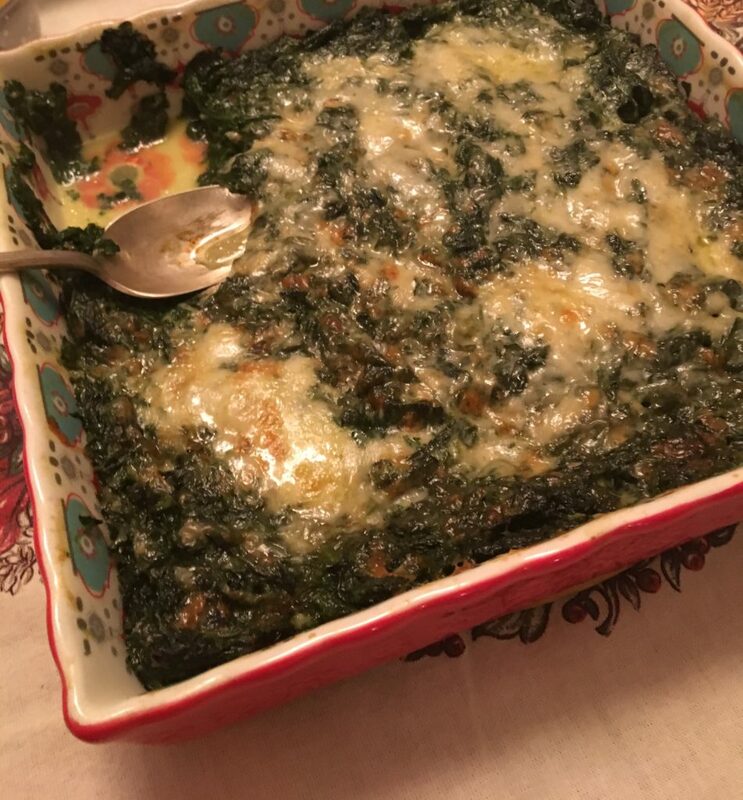 The first time I made this dish, I was cooking for Grandma and Grandpa, and one of their favorites is spinach. The second time, I played with it a bit and put it together for Thanksgiving. It was delish both times, but I definitely like the second version better. 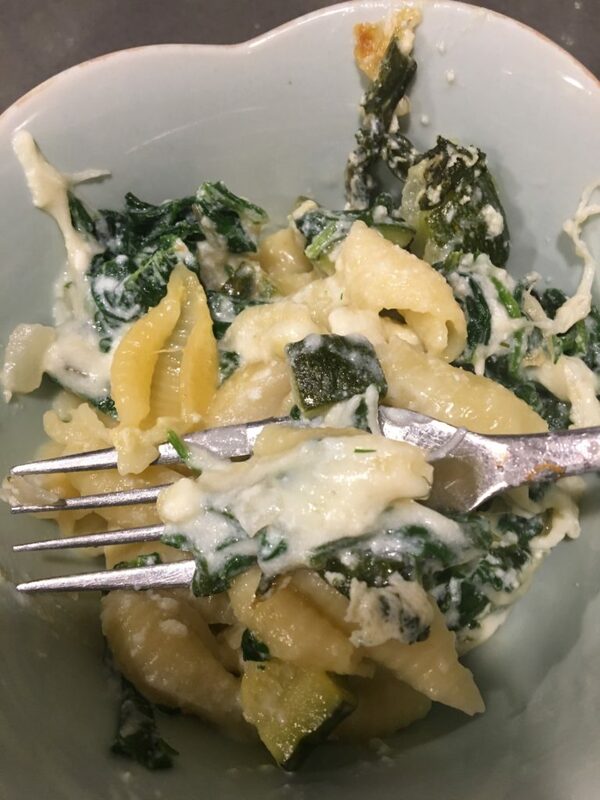 The spinach in this dish is perfectly cooked, the cheese melted and delicious, and the whole thing a perfect accompaniment to any meal. 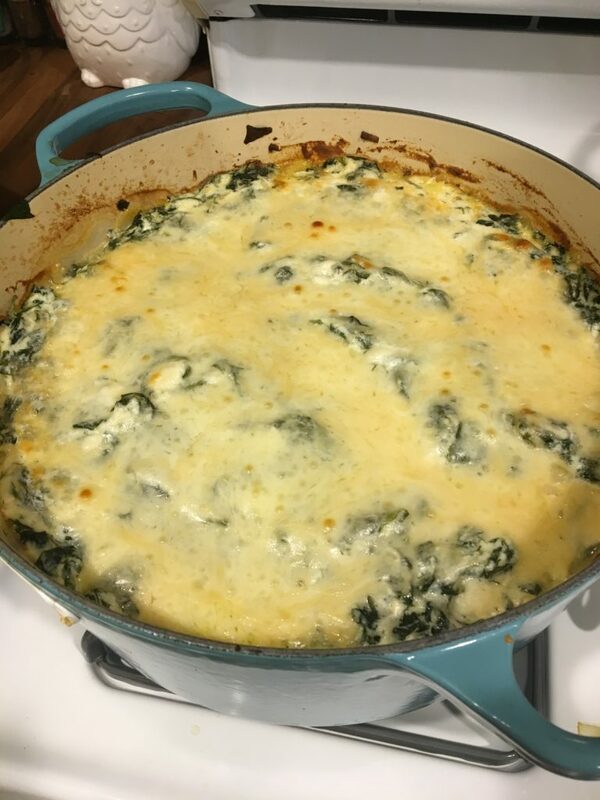 This was adapted from Smitten Kitchen’s The Best Baked Spinach. (1) Preheat your oven to 375 degrees and butter a shallow baking dish. (2) Rinse your spinach. Add to a large pot over high heat, and cook until wilting and softening, about 5 minutes. Transfer to a colander and immediately rinse with cold water. (3) Working in small amounts, squeeze as much of the water out of the spinach as possible. Roughly chop the spinach. (4) Wipe out the pan and melt the butter over high heat. Add the spinach and cook until it starts to dry (when spinach starts to stick to the pan), about 5 minutes. (5) Lower the heat, sprinkly the flour, and stir for two minutes. Then add the stock/cream/milk and allow to simmer for about 5 minutes until most of the liquid has evaporated. Season with salt and pepper. 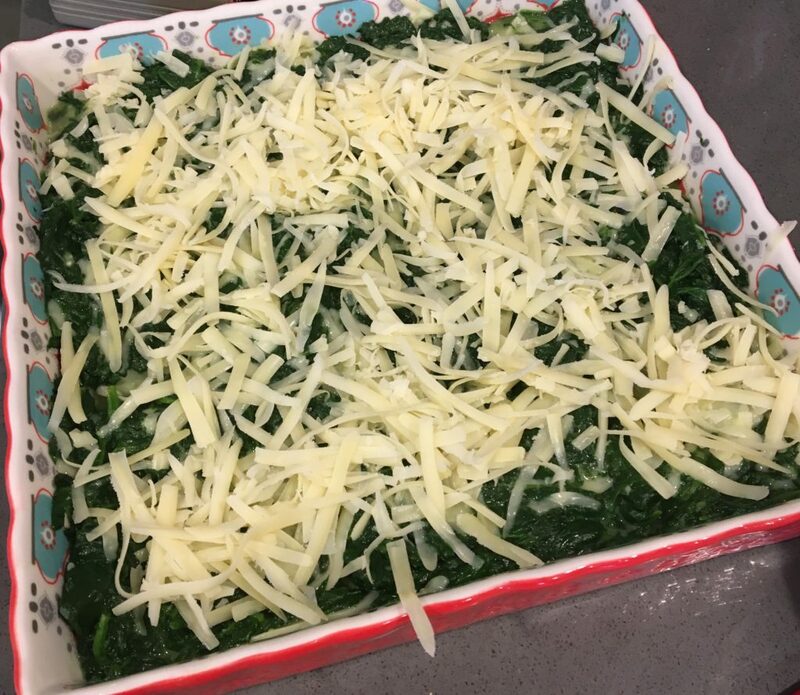 (6) Stir about half the cheese into the spinach mixture and pour into the baking dish. Sprinkle the remaining cheese on top. Bake until heated through and bubbly, about 30 minutes. Since Patrick loves lamb, any lamb recipe that I come across usually gets at least a second look. 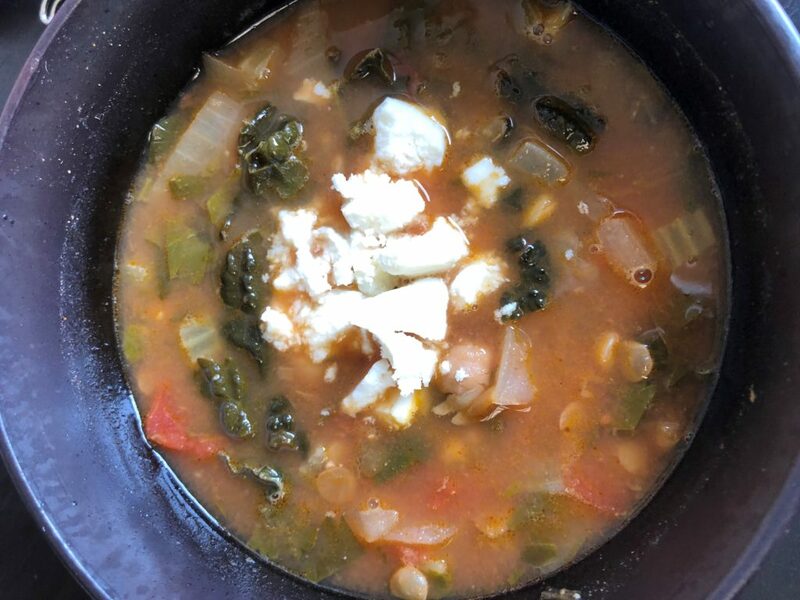 This one was particularly interesting because it was for a soup that had lentils, rice, herbs and lamb meatballs – a pot of deliciousness that we could all enjoy, and it was similar to ash joe, a favorite Persian stew. And now that Simon is working on solid-er (is that a word?) foods than just purees, this seemed perfect for him. I adapted this from a Food & Wine recipe. Hope you enjoy! (1) Heat the olive oil over medium heat. Add the onion and spices and cook until it begins to soften, about 5-10 minutes. (2) Add the lentils (drained), the rice and the water. Bring to a boil, and then reduce to a simmer and cover, stirring occasionally, until the soup thickens and the lentils and rice soften, about 1.5 hours. (3) While the soup is cooking, make the meatballs. Combine the four ingredients and roll into teaspoon sized meatballs. 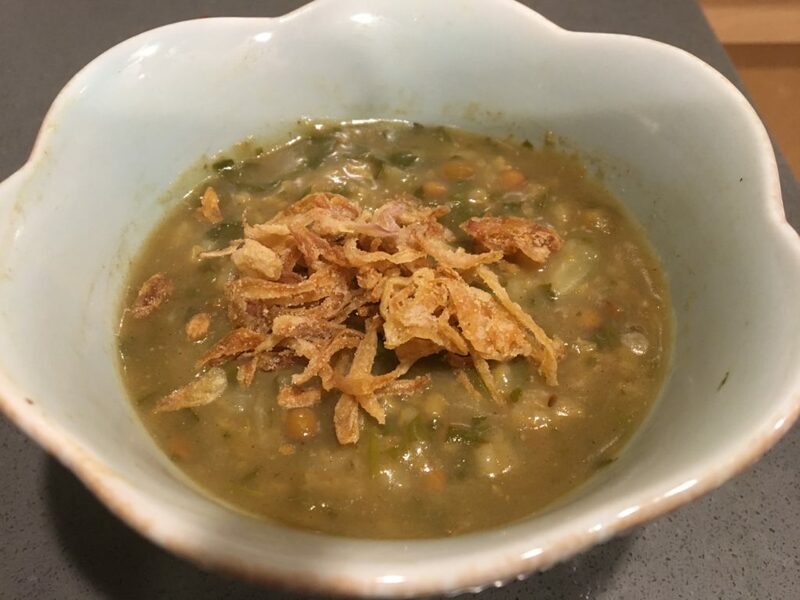 (4) After cooking the soup for 1.5 hours, add the chopped herbs and cook for another 30 minutes. Then stir in the pomegranate molasses. (5) Add the meatballs and allow to cook for another 30 minutes. 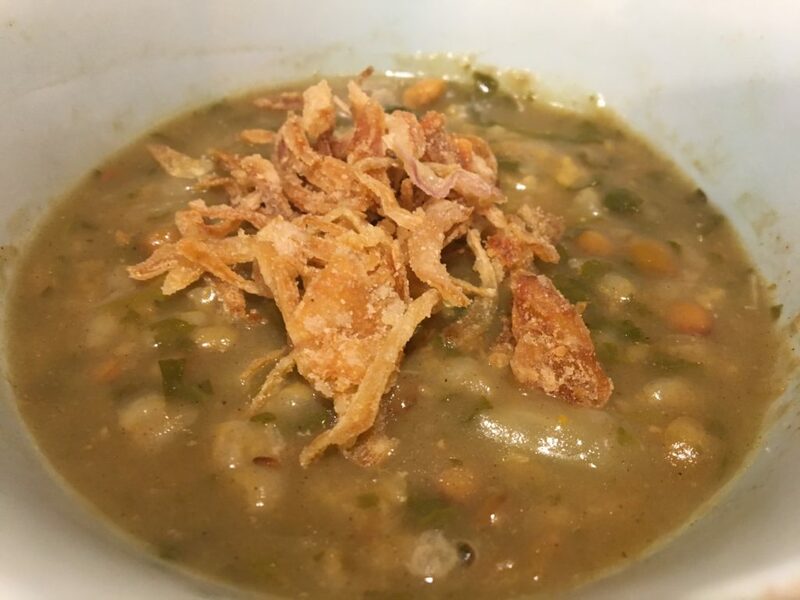 You can serve topped with crispy onions or as is. You may want to add salt to taste. If you want to make this vegetarian, just omit the meatballs.